The DCS World Website now offers a new version 2.5 of Digital Combat Simulator World (DCS World), the free-to-play digital battlefield from The Fighter Collection and Eagle Dynamics. Digital Combat Simulator World (DCS World) 2.5 is a free-to-play digital battlefield game. Our dream is to offer the most authentic and realistic simulation of military aircraft, tanks and ships possible. This free download includes a vast mission area of the Caucasus region and Black Sea that encompasses much of Georgia. It also includes a flyable Russian Sukhoi Su-25T ground attack aircraft and the famous WWII North American TF-51D Mustang. An additional 25 aircraft are available for purchase from our e-Shop and Steam. The download comes with one of the most powerful mission editors ever designed, full network play and more than 156 AI weapons systems, 105 ground vehicles and trains, 50 air defense systems, 19 ships and 84 AI aircraft permitting you to plan and play highly sophisticated missions. DCS World is massively extensible through additional DCS modules as well as user-made add-ons and mods which you can purchase and download from our site. DCS is a true “sandbox” simulation that is also designed to cover multiple time periods of interest such as World War II, the Korean War, Vietnam War, the Gulf War and others. Current regions to battle include the Caucasus, Nevada Test and Training Range, and Normandy 1944. New maps in development include the Persian Gulf, Syria, Afghanistan, and others. DCS World is fundamentally a deep, authentic and realistic simulation game designed also to offer a more relaxed gameplay to suit the user and his particular level of experience and training. The ambition is to hand hold users from novice pilot all the way to the most advanced and sophisticated operator of such complex weapons systems as the A-10C Warthog or the F/A-18C Hornet. The only next step is the real thing! The most realistic Free-to-Play digital battlefield. One-of-a-kind, internally developed graphics engine that looks amazing from one foot to 80,000 feet. Includes a beautiful, free, and highly detailed map of the Caucasus region that includes Russia and Georgia. Includes millions of buildings, millions of km of usable roads and railways, more than 50 million trees, and 20 fully-equipped airbases. Play all DCS World modules from one DCS World version. • State-of-the-art graphics with amazing lighting, shadows, and performance. Hundreds of land, air- and seaborne AI vehicles. The world is your sandbox. Mission generator included that allows rapid mission creation. • Enjoy multiplayer with friends, and even fly together in the same aircraft! Mouse interactive cockpits for most aircraft and the most accurate flight models, cockpit systems and sounds available. A DCS World 2.5 content video can be viewed HERE. 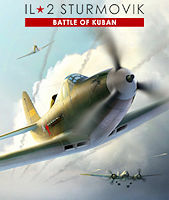 The third installment of the next-gen IL-2 Sturmovik series is dedicated to large scale aerial battles between the Red Air Force and the Luftwaffe in the skies over the Kuban front in 1943. It contains ten aircraft. This edition contains two additional Collector Planes – the legendary Spitfire Mk.VВ (Lend-Lease version imported from Britain) and the rugged German Hs-129 B-2 ground attack airplane. These two aircraft bring the total amount of included aircraft to ten in the Premium Edition. IL-2 Sturmovik: Battle of Kuban can be used as a separate product or be integrated with BOS and/or BOM, resulting in one big WWII Eastern Front combat flight-sim. DCS: F/A-18C Hornet Available for Pre-Purchase! 1C Game Studios, in partnership with Team Fusion Simulations, is proud to announce the release of a completely updated and improved BLITZ edition of the realistic air combat simulator IL-2 Sturmovik: Cliffs of Dover. Already known for its incredibly detailed cockpits, massively popular Multiplayer, and complex flight, engine, weapons and damage systems, Cliffs of Dover has now been updated to state-of-the-art DX11 graphics and has had over 20 new flyable aircraft types and variants added to it. In addition to the 25 original Spitfire, Hurricane, Bf-109 and Bf-110 types, players now have the opportunity to fly new aircraft, such as the rare Bf-109E-4N with its high octane, high-rpm engine and 30mm cannon. Players can also experience the C-6 ground attack version of the Bf-110 and the powerful twin-engine Bristol Beaufighter in both day and night-fighter versions. Glorious new autumn and winter maps allow players to continue the campaign later into 1940 and the era of the ‘Blitz’. Completely revised special effects and damage visuals provide spectacular detail, allowing players to savor the effects of their powerful weapons before sending their opponent’s aircraft crashing and burning to the ground. Speaking of which, new ground textures and scenery, as well as newly implemented cloud systems, provide for a stunning environment to fly over and through, using the revised and improved flight model that provides the accuracy and fidelity flight sim fans expect. On top of all that, new high-fidelity sounds bring the experience of virtual flight to life. This title is a must-have for experienced flight sim enthusiasts as well as newcomers to the genre, and will provide endless hours of entertainment in the company of an established, numerous and dedicated online community. Watch the IL-2 Sturmovik: Cliffs of Dover Blitz Edition – Trailer HERE. 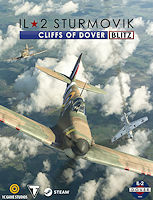 IL-2 Sturmovik: Cliffs of Dover Blitz Edition is available for purchase on Steam beginning today for USD 24.99. Customers can take 25% off the price with the time limited launch discount. All existing owners of Cliffs of Dover Classic will receive BLITZ free of charge. We are excited about December as we finally start to bring the missions to life! This means for example, in a training mission you might see a tanker takeoff while your flight taxis to the runway. You takeoff, form up and hit training area targets line astern, refuel and return to base. Another example, for the Mach Loop you may be in a flight of four aircraft transiting the loop where you may be lead or following the flight leader. We’ve dropped four patches over the past couple of months and the current version (v810.7) is now live across all branches (including VR). Head on over to the Combat Air Patrol 2 Steam community hub for full details on the last four patches and to purchase CAP2. Find out more about CAP2 at the games official website. Sim155 Ltd. has announced that Combat Air Patrol 2 (CAP2) v810.4 update for the flight and naval combat simulator game is expected to be available in early October. This new update will contain a richer environment, with more buildings, lush vegetation, and a host of custom objects including power lines, lighthouses, water tanks, ATC towers, rigs etc. Lighting has been added to roads, runways, taxiways and buildings, illuminating villages and cities for superior immersion. The cockpit lighting in the AV8B Harrier II has also been updated, including night illumination. Check out the new Combat Air Patrol 2 “Terrain Lights Promo” HERE. Combat Air Patrol 2 (CAP2) is a flight and naval combat simulator game for PC (Steam/Windows) where you pilot the AV8B Harrier II. After initial flight and tactical training you will be pitched into an immersive scenario against aggressive ground, sea and air based enemies. Use your skill as a pilot and your tactical awareness to engage in dogfights, carry out ground attacks and command your fleet to ultimately ensure the safety of your comrades and the final capitulation of the enemy. Strategic decisions such as commanding your fleet on the tactical map and your performance in the air will affect the final outcome: Go ‘gung ho’ with a full out assault and the outcome will be in the balance or plan ahead and the end result will be your ultimate victory. You can follow the development of Combat Air Patrol 2 via its Steam Community Hub and at the games official website. See for yourself if history is worth playing by watching the “Termination” gameplay trailer for Flying Tigers: Shadows Over China (“FTSOC”), the epic air-combat action game available now on Steam which is based on the historical events of America’s secret volunteer squadrons that defended China in World War 2. Published and developed by ACE MADDOX, FTSOC was created in Steam’s Early Access program which allowed the dev team to gather ongoing feedback from the game’s community while iterating, improving and adding new content and features to the game on a near-monthly basis for over a year and a half until it was released on May 29, 2017 (post-release development still ongoing). Officially called the 1st American Volunteer Group (the “AVG”), the Flying Tigers were flying mercenaries contracted by the Chinese government under President Roosevelt’s “Secret Executive Order”. Assuming fake identities, AVG recruits had to travel by ship half-way around the world to get to Rangoon, Burma. One pilot made the trip undercover with a specially-made passport indicating he was a missionary. Others posed as plantation managers, cowboys and even circus performers! China paid AVG fighter pilots a $500 bounty for each Japanese aircraft shot down. In addition, the monthly renumeration was $675 for flight leaders, $600 for pilot officers, and about $250 for ground-crew staff (at the time, about $600 bought a factory-new Ford V-8). The Flying Tigers insignia patch was designed by two Disney artists – Roy Williams and Henry Porter – together they worked up a painting of a Bengal cat leaping out of a V-for-victory sign. The AVG and the Chinese were financed and organised by White House lobbyists and advisors using shadow companies and laundered money to shield the Roosevelt Administration from violating any neutrality acts. As per Roosevelt’s “Secret Executive Order”, all Flying Tigers “volunteers” had to resign from the military and become civilians. If captured, they risked being executed as spies by the Japanese. A total of 311 “volunteers” formed the AVG. Some fought as pilots while others served in ground support roles such as mechanics, doctors, clerks and nurses. Starting out with only 99 P-40 fighters, the Flying Tigers racked up an amazing combat record in just about seven months. Their tenure collectively destroyed 297 enemy aircraft in Burma, Thailand and China. Rugged construction allowed the P-40s to withstand steep dives as the Tigers swooped down on the Japanese from high above using “hit and run” tactics invented by their daring flight instructor, Claire Lee Chennault. This caused Japanese fighter pilots to view the Flying Tigers with bittersweet respect. They thought the Tigers didn’t fight fair. On the 4th of July 1942, the American Volunteer Group aka the Flying Tigers were disbanded as the Chinese contract expired and the onslaught of World War 2 made further non-official (covert) operations politically difficult. After July 4, the U.S. Army 23rd Fighter Group took over the AVG P-40s but only five tiger pilots accepted induction. For morale and propaganda, the Flying Tigers name was retained for the 23rd pilots. After the AVG were disbanded, the U.S. refused to recognize the Flying Tigers. That position remained unchanged until 1991 when the “honorably discharged” Tigers officially became WW2 veterans. Get more information about the game at the official Flying Tigers: Shadows Over China website. Sim155 Ltd. has announced that Combat Air Patrol 2 (CAP2) v810 update has been released. v810 includes new satellite imagery, OpenStreetMap data, MCAS Yuma, Barry M Goldwater Range and the Mach Loop in Wales. A promo video featuring the new changes in the update is also available for viewing. UPDATE: Since the v810 release, v810.2 has been released, having fixed a number of small teething issues over the weekend. Sim155 Ltd. has announced that Combat Air Patrol 2 (CAP2) v810 will be released before the end of June. v810 will include new satellite imagery, OpenStreetMap data, MCAS Yuma, Barry M Goldwater Range and the Mach Loop in Wales. You can preview the updates in the new promo video.